History: (X-Force I#116 (fb)) - At the New York Headquarters of the music channel Sonic TV, Boyz R Us were being held captive by murderous gunmen. Unless their demands were met, the gunmen intended to kill a member of the band every hour. The Shy One was killed and thrown out of a plate-glass window with the promise that the One With the Dreads would be next. (X-Force I#116) - After a briefing on the mission, X-Force teleported inside the Sonic TV Headquarters to save Boyz R Us. Upon their arrival, Zeitgeist grabbed two of the bandmembers while Gin Genie destroyed the ground beneath them. 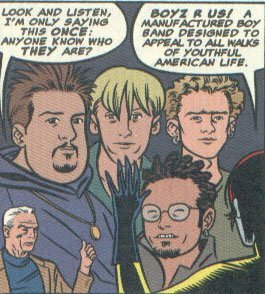 Zeitgeist looked out of the window in time to see a helicopter blow himself, the entirety of Boyz R Us, and nearly all of X-Force to pieces. Comments: Boyz R Us created by Peter Milligan and Michael Allred. anyone else with Boy names or any other boybands including the Backstreet Boys, N*Sync, 98 Degrees, L. F. O., etc. etc.